If you read my post on the 15 phrases I never would have said if I didn’t have kids, you can understand why there might be times when it is difficult to stay positive as a parent. My sister told me about a speaker (John Bytheway) she heard who said we need to switch our buts. Yeah, I know– it sounds a little scandalous… or like the latest work out video, but it’s not like that. His point was we often say things like, “I love him, but he drives me crazy,” or, “She’s a good kid, but she never cleans her room,” and we tend to focus on what comes after the but. So, why not switch our buts and focus on the positive instead, he suggests? “He drives me crazy, but I love him.” “She never cleans her room, but she’s a good kid.” It completely changes what we say into something positive and can change the way we view people. I love this concept. I was thinking about how easy it is to focus on all the problems and frustrations our young children can cause in our lives, and what a difference it could make if we applied the switching our buts principle here and started to focus on all the problems they eliminate from our lives instead? Admittedly, I had to stretch a little to find the other side of the but on some of these, but I did it. I switched my buts. And by doing so I can now present to you 20 problems you don’t have to worry about if you have children. 2- Kids drink a ton of milk, but you will never have to worry about it going sour before you use it all. Even if you buy 5 gallons a week. Which I do. 3- Kids are always begging for candy, but you know how sometimes you hide candy and then forget where it is? Not a problem. Your kids will ALWAYS be able to find it for you. 4- Kids take an enormous amount of time and energy, but you will never have to worry about what to do with your spare time, because you won’t actually have any. And if you do, you will spend it looking for your kid’s shoes… usually unsuccessfully. 5- Kids make lots of messes, but you won’t need to sit and stew about whether your house will be clean if someone stops by unexpectedly. It won’t! Guaranteed! So, just don’t worry about it! As an added bonus, this makes it really easy for you to figure out who your real friends are, by their reaction to all the “life” as I like to call it, scattered all over your house. 6- Kids make it impossible to keep your house or car clean, but you also won’t ever need to try to come up with a legitimate excuse for why your house or your car is dirty. You just say, “kids,” and people will give you that knowing look. 7- Kids are expensive, but you won’t have to waste time trying to figure out what to spend your tax return on– dentist bills or a trip to Disneyland. Done. 8- Doing homework with your kids can be agonizing, but you don’t have to worry about forgetting everything you learned in school! Those story problems and Geometry proofs will come back to haunt as you relearn it all with each of your children. 9- 2-year-olds can be destructive, but were you wondering how to decorate your walls? Because, no worries! Your two-year-old has it covered. Literally. Covered… in a lovely variety of marker strokes. Incidentally, if you lose your markers, you can always count on your two-year-old to find them for you. 10- Kids movies can be annoying… after the 100th time listening to them in the background of your life. But good news! You will never have to feel stupid when you hang out with a bunch of first graders because you don’t know all the words to every song in the latest Disney movie. Oh, you’ll be belting them out with the best of them! 11- Kids are always needing something from you, but on the plus side, as a parent, you rarely feel all alone in the world. As the song says, “you’ll never walk alone.” Or pee alone for that matter. 12- It is hard to find time for each other when you have kids, but trying to figure out what to do for a date night when you finally have time for one is no longer a problem. It doesn’t matter what you do. Even strolling down the aisles of WalMart together will be a welcome reprive. 13- Kids have a hard time staying out of your purse, but what’s great about that is that you never have to wonder what happened to all your gum. You can easily find it in your kid’s mouths and your baby’s diaper. 14- Parenting can be exhausting, but you never have to worry about sleeping through your alarm. You actually gave birth to THE most effective alarm clock on the market. How incredible is that? 15- Sometimes the house is such a mess with kids that you can’t find anything you are looking for, but you never have to wonder where the Lego’s are. They will always be under your foot when you are walking in the dark to the bathroom at 2am. Always. 16- Finding a babysitter when you need one can be stressful and expensive, but, fortunately, with kids, you always have a legitimate excuse to get you out of any awkward social experience that might present itself. One of your kids will pretty much always be sick– so that company party you are dreading? Sick kids can fix all that! 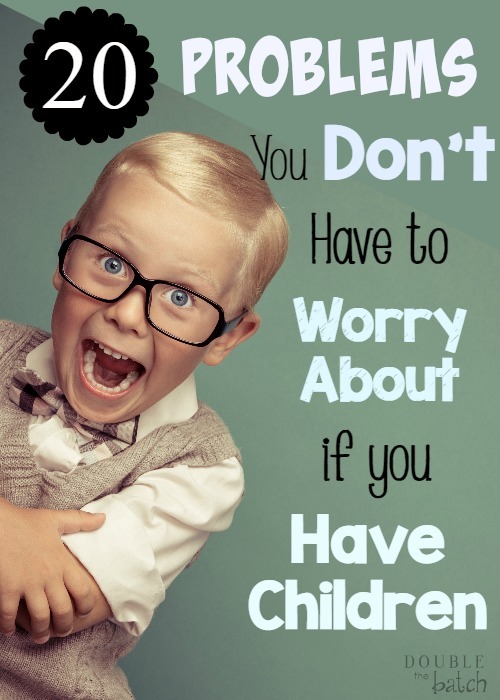 And now you don’t need a sitter, which means more money in your pocket… for doctor bills. 17- Life with kids sometimes feels like a three-ring circus, but it is the cheapest circus you will ever get to participate in. And without the freak shows, which is nice. Barnum and Bailey– they’ve got nothing on us. 18- It is hard to find time for friends when you have kids, but when you do get a chance to go out with friends, you never have to worry about a moment of awkward silence because you will always have a story to tell. Or 15. And so will they. 19- Kids can be brutally honest, but you never have to worry about not having someone in your life who is willing to tell you the truth. Your 4-year-old will always be willing to tell you if your pants make your bum look big, but in their next breath, and with a simple hug, they will teach you the truth that you are valuable and loveable no matter how those pants might make your bum look. 20- Parenting can be overwhelming and exhausting, but one innocent, care-free burst of laughter or an out of the blue I love you from your child has the power to breathe new life into you and help you remember what really matters and that it’s all worth it. If you liked this post you might also enjoy this post from Trish or this post from Katie!